A Vibrating Sample Magnetometer (VSM) is a scientific instrument able to measures magnetic properties of materials in an external magnetic field, invented in 1955 by Simon Foner at Lincoln Laboratory MIT. A VSM converts the dipole field of the sample into an ac electrical signal. The sample is placed inside a uniform magnetic field and then vibrated sinusoidally. That creates a corresponding variation of the magnetic flux in pickup coils placed nearby, inducing a sinusoidal voltage. The amplitude of the ac voltage is proportional to the sample magnetic moment and measured by a lock-in amplifier. MicroSense Vibrating Sample Magnetometers (EZ-9) are the easiest to use and most sensitive vibrating sample magnetometers available. 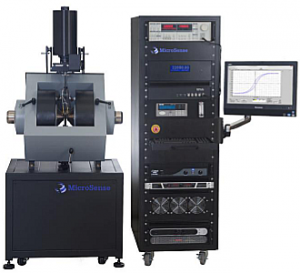 EZ-9 is able to measure magnetic moments down to 1 µemu, hysteresis loop of thin films or studying the magnetic properties of liquids, powders, or bulk samples. Moreover, by using MATLAB we are able to perform manual or fully-automatize magneto-electric measurements, even with the temperature option. Patterned devices produced by lithography can be connect through bonding to a proper sample holder. The properties of devices can be studied as a function of magnetic field, temperature, currents and electric fields. Finally, it is possible to perform automated complex preparation sequences (e.g. magnetic field cooling for spintronic devices based on antiferromagnets).